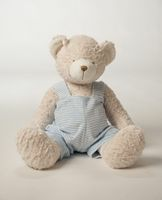 Home > Gifts for Babies & Children > Fuzzy Friends > Benny & Beatrice Overall Bears ---Now available in 3 Sizes! Bear: Please Choose OneBenny with Blue OverallsBeatrice with Pink Overalls Size: Please Choose OneSm-10inch (-$12.00) $26.95Med-18in (Most Popular) Large-24 (+$16.00) $54.95 Personalization: Please Choose OneNoneSingle InitialMonogramName Initial, Monogram, or Name: Font Type: Please Choose OneNoneDiamond (monogram)Circle Script (monogram)FishTail (monogram)Block8Block107Script10Script51EScript51A#15A Font#40 FontCurlyStacked(monogram) Block Stacked (monogram) Thread Color: Please Choose OneNoneRedOrangeYellowDark GreenLight GreenBlueLight BlueDark PurpleLight PurplePinkBlackBrown Who is this item for? Benny & Beatrice’s friendship will last well beyond baby’s first year. Luxurious texture gives an exciting dimension to a nursery classic. Removable overalls are easily monogrammed for personalization. Perfect gift for siblings or Big Brother/Sister Gifts!